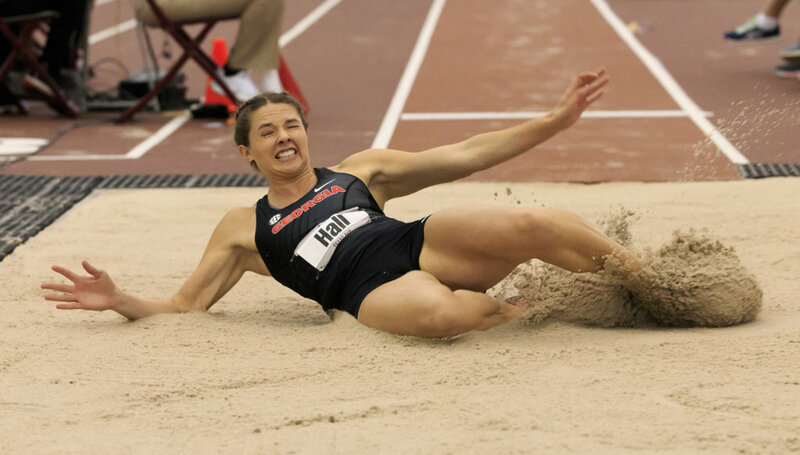 After winning her first NCAA championship last spring, Kate Hall of Casco is focused on winning a second long jump title at the Division I indoor track championships Friday in College Station, Texas. The University of Georgia junior is ranked first in the long jump with a mark of 21 feet, 9.5 inches, and eighth in the 60-meter run with a time of 7.22 seconds. Hall, the national high school record-holder in the long jump (22-5), is trying to help Georgia win its first NCAA women’s indoor track championship. 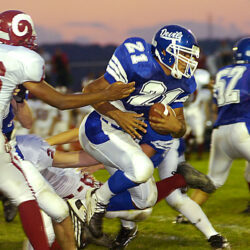 The top-ranked Bulldogs finished second last year. Hall will compete at 6:15 p.m. Friday in the preliminary round for the 60 meters. The long jump is at 7:10 p.m. Friday, and the 60 final is at 4:40 p.m. Saturday. Hall said she’s mostly focused on winning the long jump, but also hopes to aid her team’s championship quest by scoring in the 60. A secondary goal is breaking the NCAA long jump record (22-8). Hall finished fourth in the long jump at last year’s indoor championships (21-3.75), earning All-America honors for the first time. Last spring, she won the outdoor title with a school-record leap of 22-1. She has been ranked No. 1 in the long jump all season after jumping 21-9.5 on Jan. 6, a distance she matched Feb. 24 when she won the Southeastern Conference title. Hall is encouraged by her consistency this season. She has jumped 21-6 or better at all four of her meets, and farther than 21-8 three times. She is also faster, having run a personal best in the 60 at the SEC championships. Working with Georgia coach Petros Kyprianou has helped Hall adjust her start, her takeoff and her overall technique. Kyprianou also coaches Hall’s training partner, Keturah Orji, who is the American and collegiate indoor triple jump record-holder (46-11.75). Orji also is a top contender in the long jump. Kyprianou, who coaches Georgia’s jumpers and multievent athletes, said Hall has dramatically improved her foot placement, which has helped her avoid taking off too far before the board and losing out on precious inches. Kyprianou said it’s only a matter of time before Hall rises to another level. Penn State junior Isaiah Harris of Lewiston also will compete Friday in the 800 meters. Harris won his third Big Ten indoor title two weeks ago and goes into the NCAA championships seeded seventh with a season-best of 1:47.38. He finished fourth last year, then placed second at the outdoor championships. The 800 semifinals are at 7:15 p.m. Friday, and the final is 5:30 p.m. Saturday.